Albrecht Dürer was undoubtedly one of the greatest artists of his time. He was one of the first to explore the artistic possibilities of the self-portrait; his drawings from nature are lively and naturalistic. Much of his work shows a modern scientific care for exactness, added to an almost uncanny intuition. His drawing of a rhinoceros, for instance, was based on a description and someone else’s rough sketch: he never saw one in the flesh. He made what is possibly his most famous engraving, Melencolia I, in 1514. He includes the date in the bottom line of figures in the so-called ‘magic square’ to the right of the composition. While the subject matter of his other engravings is perhaps easier to read (St. Anthony; St. Jerome in his study; The Prodigal Son; Death, the Knight and the Devil) Melencolia I remains something of a mystery: the central figure sitting in an attitude of melancholy, the dog lying listlessly at her feet, the bored looking cherub, or putto to her left, the tools and pieces of wood scattered about, the large geometrical shape to the left of the composition, the magic square mentioned above; and so on. Questions arise on looking at the picture, such as: Who is she? Why is she so melancholy? Although we shall probably never solve all the riddles in the work, I believe that we can begin to approach an answer to some of them by looking at the system of education that was widespread in Dürer’s time. There were once two paths in education: the threefold path, or Trivium, and the fourfold path, or Quadrivium. The Trivium was composed of Grammar, Rhetoric and Dialectics (later replaced by Logic, hitherto thought of as an aspect of Dialectics). The Quadrivium was Arithmetic, Geometry, Music and Astronomy. Each of these disciplines was personified in a goddess-like figure. To study the subjects that these goddesses represented had the quality of approaching a religious mystery. Among those scholars of the Middle Ages who characterized the Seven Lively Arts in this way were the scholars of the School of Chartres that grew up around the great cathedral. This was a somewhat esoteric group of largely Cistercian monks. One such was Alan of Lille, who used the popular imagination of the Seven Liberal Arts as described by the 4th Century AD scholar Martianus Capella, in his work The Marriage of Philology and Mercury. There were others before him to write about these goddesses. Alan wrote about them in his book Anticlaudianus, or The Good and Perfect Man. He describes there how the goddesses of the Trivium and the Quadrivium help to build a chariot for one of the seven Virtues, Prudence, to travel to the highest heaven, in order to persuade God to allow for the creation of a new soul for the human being. Of these goddesses of education, Grammar is the oldest. She is a hag who had come into the world at the time of Osiris. She lived far from the haunts of men until she was discovered by Hermes. She carries a sharp knife to perform surgery on the lips and teeth of those who could not otherwise speak properly. Her ‘planet’ in the medieval sense of the term, is the Moon. Rhetoric is a beautiful, majestic woman of mature years, dressed in a highly colourful robe. Her planet is Venus. Dialectics is a pale woman of severe aspect, dressed all in black. She holds a serpent in her hand. Mercury is her planet. These three make up the Trivium. The goddesses of the Quadrivium are as follows: Music comes announced by a symphony, and is accompanied by the Three Graces, who go before her, singing as they go. She is harmonious and well-balanced, and she belongs to the Sun. Arithmetic is a beautiful and stately figure. Rays of light radiate from her brow and ray back, emerging from unity and returning to unity. She belongs to Mars. We shall return to Geometry and Jupiter shortly. Astronomy appears in a fiery ball of light. She is a maiden in a robe decorated all over with diamonds. She wears a crown of stars, and in her hands is a book made of various metals in which the progress and paths of the stars are described. Her planet is Saturn. Finally for our present purposes, and most interestingly for understanding Melencolia I, comes Geometry. She is depicted as a woman of sturdy limbs, who holds a pair of compasses in one hand and a sphere in the other. Her task is to describe and explain the world of Nature, the created world, to the Gods. She belongs to the planet Jupiter. Over the entrance to Plato’s school, the Academy, was inscribed the words ‘Let No One Ignorant of Geometry Enter.’ The study of geometry was clearly highly revered by the great philosophers – possibly because of the direct connection that it makes with the world of the gods. After all, you do not have to show me a triangle; I have the concept – the spiritual form, so to speak – within my thinking. The realm of such forms is already the world of the gods, and most of us in our time can gain access at least to that divine region. We can see that in Dürer’s engraving the sturdy-limbed female figure is holding a pair of compasses, while her sphere lies on the floor. The magic square behind her is the one associated with the planet Jupiter. Each of the seven planets of medieval astronomy was awarded its own magic square, with the number of smaller squares shown within them becoming greater, the nearer to Earth the planet. While Jupiter’s square for instance contains sixteen smaller squares, four lines of four, the Sun’s square has six lines of six. Each line of the Sun’s figures adds up to 111, making a sum of 666! The Moon’s square has 81 smaller squares within it. If the presence of the compasses, sphere and Jupiter magic square are not enough evidence to make the connection with Geometry, consider the woodworking tools and pieces of wood scattered on the floor. What is carpentry, after all, but a sort of practical geometry? Then there is the large stone form, the so-called ‘Durer Solid’. But remember the task of Geometry: to describe and explain the world to the gods. She sits motionless, her eyes burning into the distance. The putto to the left of her in the picture, sits listless, and the dog – symbolic of the active soul from the days of Socrates to the time of the later writers of Grail romances – lies inert. 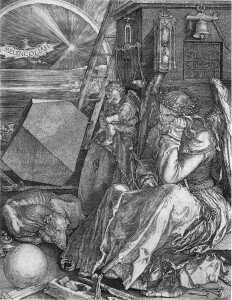 Meanwhile, the physical world almost overburdens the picture; the clutter of the wood, the millstone on which the putto sits, the great Durer Solid; the scales, too, remind us of the weight of things. Why was Geometry not climbing the seven rungs of the ladder behind her to the realm of the gods? Perhaps we can find the answer in the changes that were happening in the culture of the day. Dialectics, the ability to find the truth through conversation in which ‘two or three gathered together’ might possibly reach the heights of noesis (the highest form of knowledge available to human beings, according to Plato) is now replaced by Logic. The logic developed by the schoolmen of the Middle Ages, and still well in use by Durer’s time, contains all its elements within it. There is no room for the new inspirations that noesis might afford. The planet associated with Dialectics was Mercury, god of thieves, doctors and merchants – those who keep things in movement. Logic of the Renaissance kind did not allow for much movement. The culture of Europe was moving towards the view of the world characterised by some of Shakespeare’s characters almost a century later, in which the human being was seen as clothed in ‘a muddy vesture of decay’ and the world itself seen as a ‘sterile promontory’. The material world was, in a sense, becoming ‘heavier’. A common experience of those who suffer from melancholia is that the body itself becomes too heavy to raise from the bed or chair. The mood of the piece is amplified further by the bat-like creature unfolding the banner holding the title of the work, while the comet and rainbow promise no divine signal or new covenant with God. They hardly illuminate the darkness of the background, and the sands of time in the hourglass above the head of Geometry trickle on into a new age. As the culture of north west Europe became more materialistic, perhaps the realm of the gods and that of human beings grew further apart, and Geometry was no longer required to perform her duties of communication, and was reduced to measuring and delineating, and she has let the sphere, symbolising the world, to fall to the floor. It is no longer part of her divine remit. Thus, perhaps she herself became melancholy, as so many of us do when we are unemployed.